There were just a few isolated patches of snow around Pulpit Rock, but getting to Kjerag would be a long ski tour at the moment. Pulpit Rock is known as prekestolen, or preikestolen, in Norwegian. Kjerag is now open, with quite a few patches of snow remaining in this high mountain area. 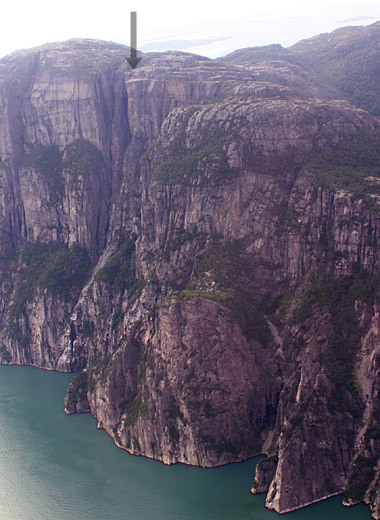 The pictures were taken in summer 2007, from the helicopter trip which takes you from Stavanger Sola airport to Pulpit Rock and back for around 1000 kroner per person, or on a longer trip that ncludes Månafossen waterfall and Lysefjord. The black arrow points out the platform of Pulpit Rock, and the smaller picture below shows the people admiring the views.